Vienna Chamber Orchestra performs Haydn, Mozart and Dvorak. Dom Muzyki Svetlanov Hall. Brahms Trio performs Dvorak. Dom Muzyki Chamber Hall. 7 p.m.
MT PICK Chamber Orchestra of Russia performs Mozart's Divertimento for string orchestra, Beethoven's Concerto for piano, violin, cello and orchestra and Schubert-Mahler's Death and the Maiden. Soloists Reinis Zarins (piano), Maxime Ganz (cello) and Pablo Martin Acevedo (violin). Alexei Utkin conducts. Tchaikovsky Concert Hall. 7 p.m.
Gradus Ad Parnassum: festival of piano music. Conservatory Rachmaninov Hall. 7 p.m. Free admission. Marlena Mosh (vocals), Alexander Malkus (piano) and Rudolf Nanyan (duduk) perform early Armenian chants and folk songs. Arkhipovsky Salon. 7 p.m.
New Music: Academy of Early Music Ensemble performs Silvestrov. Philharmonic Chamber Hall. 7 p.m. Pipes All Around: Olesya Kravchenko (organ) and Sergei Kovalyov (bagpipes) in concert. St. Andrew's Anglican Church. 7:30 p.m. Tribute to Svyatoslav Richter: Chamber Orchestra of Russia, Yury Favorkin (piano), Anna Kandinskaya (violin) and Maria Chepurina (flute) perform Bach, Haydn, Salieri and Mozart. Soloist and conductor Alexei Utkin (oboe). Conservatory Great Hall. 7 p.m. Tribute to Verdi: Galina Vishnevskaya Opera Center soloists and orchestra in concert. Galina Vishnevskaya Opera Center. 7 p.m.
MT PICK Vienna Chamber Orchestra performs Haydn, Mozart and Dvorak. Dom Muzyki Svetlanov Hall. 7 p.m.
MT PICK 100 Violins: Budapest Gypsy Symphony Orchestra in concert. Dom Muzyki Svetlanov Hall. 7 p.m.
Bach and Techno: Rostislav Sharayevsky (marimba, vibraphone, percussion) in concert. Scriabin Museum. 7 p.m.
Blagovest Ensemble performs Schubert's Magnificat and Mozart's Litaniae. Dom Muzyki Chamber Hall. 7 p.m.
Malenkaya Capella Chamber Choir performs Elgar, Degtyaryov, Mussorgsky, Rachmaninov and Sviridov. Sts. Peter and Paul Evangelical Lutheran Cathedral. 10 p.m.
Moscow Conservatory Choir performs Bach. Conservatory Small Hall. 7 p.m. Admission by free tickets. New Age of Cello: Georgy Gusev plays Gaspar Cassado and Giovanni Sollima. Arkhipovsky Salon. 7 p.m.
Student Concert of piano music. Conservatory Rachmaninov Hall. 7 p.m. Free admission. 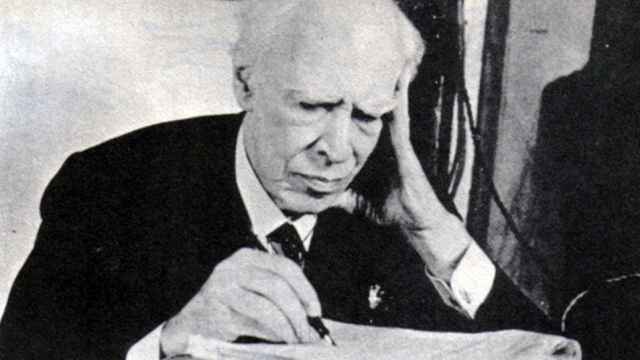 Tchaikovsky Symphony Orchestra performs Berg's Three Pieces for orchestra, Webern's Passacaglia, Beethoven's Symphony No. 4 and Schoenberg's Theme and Variations. Theodor Guschlbauer conducts. Conservatory Great Hall. 7 p.m.
MT PICK 100 Violins: Budapest Gypsy Symphony Orchestra in concert. Dom Muzyki Svetlanov Hall. 3 and 7 p.m.
Alexander Fiseisky (organ) performs Bach. St. Mary's Cathedral. 8:30 p.m.
MT PICK Five O'Clock at the English Club: Lyudmila Khersonskaya (violin), Pyotr Kondrashin (cello) and Pavel Dombrovsky (piano) perform Schubert and Beethoven. Museum of the Contemporary History of Russia. 5 p.m.
FESTIVAL Guitar Virtuosos: Edoardo Catemario, Pavel Steidl, Yasuji Ohagi, Marcin Dylla, Artyom Dervoyed and the Novaya Rossiya Symphony Orchestra in concert. Freddie Kadena conducts. Tchaikovsky Concert Hall. 7 p.m.
Madrigal Ensemble performs Lully's Le Bourgeois Gentilhomme. Philharmonic Chamber Hall. 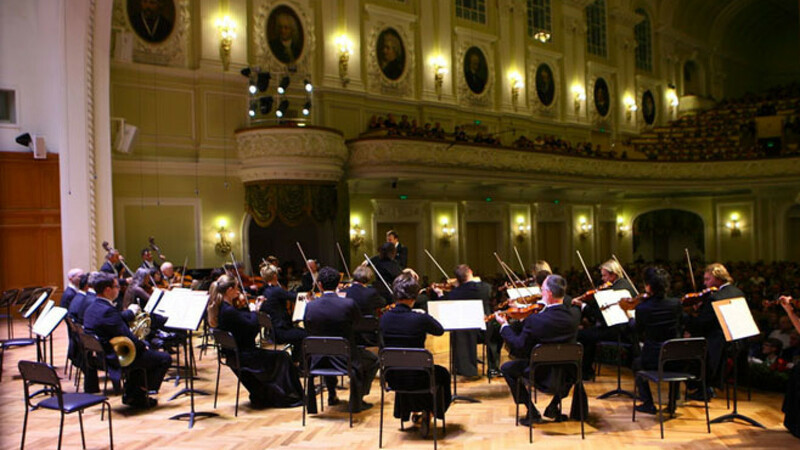 7 p.m.
Moscow Conservatory Chamber Orchestra performs Mozart, Sarasate, Piazzolla and Bach. Conservatory Great Hall. 7 p.m.
Soloists of Moscow Chamber Ensemble Musicians perform Takemitsu, Denisov, Daugherty, Beethoven and Brahms. Conservatory Small Hall. 7 p.m. Admission by free tickets. Tchaikovsky performed by Olga Terentyeva (soprano), Yulia Fomina (mezzo-soprano), Konstantin Moshkin (tenor), Nadezhda Merzlyakova (piano) and others. Sts. Peter and Paul Evangelical Lutheran Cathedral. 7 p.m.
Yulia Turkina (piano) and Alexander Zagorinsky (cello) perform Myaskovsky, Stanchinsky and Appleton. Conservatory Rachmaninov Hall. 7 p.m.
Alexander Gindin (piano) performs Vivaldi, Rachmaninov, Albenis, Granados and Ravel. Conservatory Great Hall. 7 p.m.
Alexei Semyonov (organ) performs Bach, Krebs and Reger. Sts. Peter and Paul Evangelical Lutheran Cathedral. 7 p.m.
Arvid Gast (organ) performs Bach, Franck and Reger. St. Mary's Cathedral. 7:30 p.m.
Chamber Orchestra of Russia performs Schubert-Mahler, Pasculli and Mozart. Dom Muzyki Chamber Hall. 7 p.m.
Five O'Clock at the English Club: Sergei Kasparov (piano) performs Scarlatti, Berg, Chopin and Beethoven. Museum of the Contemporary History of Russia. 5 p.m.
Fyodor Stroganov (organ) and Yekaterina Pushkarenko (guitar) perform Vivaldi and Bach. St. Andrew's Anglican Church. 7:30 p.m.
FESTIVAL Guitar Virtuosos: closing gala concert. Tchaikovsky Concert Hall. 7 p.m.
Mikhail Mordvinov (piano) performs Bach, Satie, Newman and Bach-Rachmaninov. Scriabin Museum. 7 p.m.
Nicolae Dumitru (piano) performs Bach and Liszt. Philharmonic Chamber Hall. 7 p.m.
Student Concert of brass music. Conservatory Rachmaninov Hall. 7 p.m. Free admission. MT PICK The Swingle Singers of Britain in concert. Dom Muzyki Svetlanov Hall. 7 p.m.
Yelizaveta Kozina (harp), Anna Morozova (cello) and Anastasia Sokolova (piano) perform Bach, Corelli, Schumann, Shostakovich and others. Scriabin Museum small hall. 5 p.m.
Celtic Consort Ensemble in concert. Philharmonic Chamber Hall. 7 p.m.
Concert of Iranian Music. Conservatory Great Hall. 7 p.m.
Operatic Show, featuring Nadezhda Gulitskaya (coloratura soprano), Svetlana Sergeyeva (dramatic soprano), Svetlana Kotina (mezzo-soprano), Vladimir Avtonomov (baritone) and guests. Dom Muzyki Svetlanov Hall. 7 p.m.
Student Concert of violin music. Conservatory Rachmaninov Hall. 7 p.m. Free admission. Irina Plotnikova (piano) performs Mozart, Schubert and Chopin. Conservatory Small Hall. 7 p.m.
Musica Nova: works by contemporary Russian composers. Dom Kompozitorov. 7 p.m.
Moscow Danilov Monastery Men's Choir in a concert of Russian spiritual music. Tchaikovsky Concert Hall. 7 p.m.
Robert Holl (bass-baritone) performs Mussorgsky's Songs and Dances of Death, arias and romances by Borodin and Rimsky-Korsakov. Dom Muzyki Chamber Hall. 7 p.m.
Alexander Chernov (violin) and the Violini di Maestro Ensemble perform Paganini. Scriabin Museum. 7 p.m.
Concert of Piano and Chamber Music: Yulia Chernyavskaya (piano) and the Ippolitov-Ivanov Quartet perform Mendelsohn, Schumann and Brahms. Golitsyn Manor. 7 p.m.
Lyubov Shishkhanova (organ) and the Sveshnikov Boy's Choir perform Pergolesi, Bach and Franck. Tchaikovsky Concert Hall. 7 p.m.
Mikhail Turpanov (piano) performs Schubert, Lachenmann and Furrer. Tchaikovsky Cultural Center. 7 p.m.
Mussorgsky: chamber vocal compositions performed by soloists of the Bolshoi Theater. Bolshoi Theater Beethoven Hall. 7:30 p.m.
Stefan Engels (organ) performs Bach, Schubert, Karg-Elert and others. Conservatory Small Hall. 7 p.m.
Student Concert. Conservatory Rachmaninov Hall. 7 p.m. Free admission. Tchaikovsky String Quartet performs Haydn's Seven Last Words of Christ. St. Mary's Cathedral. 8 p.m.
Tchaikovsky Symphony Orchestra performs Janacek's Sinfonietta, Rachmaninov's Piano Concerto No. 1 and his The Rock symphonic fantasy. Soloist Vadim Rudenko, conductor Denis Lotoyev. Conservatory Great Hall. 7 p.m.
MT PICK Alexandra Durseneva (mezzo-soprano), Yelena Zelenskaya (soprano), Darya Zykova (soprano) and Vsevolod Grivnov (tenor) perform Borodin, Glinka, Rossini, Wagner and Verdi. Bolshoi Theater Beethoven Hall. March 27, 7:30 p.m. Early Music Academy Ensemble performs Bach. Philharmonic Chamber Hall. March 27, 7 p.m.
From Vivaldi to Rock: Classic Girls in concert. St. Andrew's Anglican Church. March 27, 7:30 p.m.
Hermitage Ensemble performs dance music by Piazzolla, Chopin, De Falla, Strauss and Kancheli. Dom Muzyki Chamber Hall. March 27, 7 p.m.
FESTIVAL Mstislav Rostropovich: London Philharmonia Orchestra performs Beethoven's Symphony No. 3 and Sibelius' Symphony No. 5. Esa-Pekka Salonen conducts. Conservatory Great Hall. March 27, 7 p.m.
Igor Kotlyarevsky (piano) and Arseny Kotlyarevsky (cello) perform Beethoven and Franck. Scriabin Museum small hall. March 27, 7 p.m.
Ray Chen (violin) and the Moscow Philharmonic Orchestra perform Mozart's Violin Concerto No. 4 and Tchaikovsky's Violin Concerto. Also in program are Mendelssohn's Symphony No. 1 and Tchaikovsky's Italian Capriccio. Yury Simonov conducts. Tchaikovsky Concert Hall. March 27, 7 p.m.
Irina Bochkova (violin) and Ruvim Ostrovsky (piano) in concert. Conservatory Small Hall. March 28, 7 p.m.
FESTIVAL Mstislav Rostropovich: London Philharmonia Orchestra and the Yurlov Capella perform Shostakovich's Symphony No. 4 and his Orango. Soloists Steven Page (baritone), Allan Clayton (tenor), Henry Waddington (bass-baritone), Sally Silver (soprano) and Daniel Norman (tenor). Esa-Pekka Salonen conducts. Conservatory Great Hall. March 28, 7 p.m.
Pavel Kogan Orchestra, the Ministry of Defense Orchestra, the Sveshnikov Russian Choir, the Yurlov Capella and the Gnesin Academy of Music Choir perform Beethoven's Symphony No. 4 and Berlioz's Grande Symphonie Funebre et Triomphale. Pavel Kogan conducts. Tchaikovsky Concert Hall. March 28, 7 p.m.
Pavel Slobodkin Center Chamber Orchestra performs Beethoven's Symphony No. 1. Mozart's Piano Concerto No. 17, Schumann's Piano Concerto and Mendelssohn's A Midsummer Night's Dream. Soloists Miroslava Marchenko and Varvara Kutuzova. Pavel Slobodkin Center. March 28, 7 p.m.
Stefan Engels (organ) performs Bach, Franck, Langlais and Lefebure-Wely. Sts. Peter and Paul Evangelical Lutheran Cathedral. March 28, 7 p.m.
Five O'Clock at the English Club: Alexander Andreyev and Yulia Getallo (piano duet) perform Schumann, Schubert, Beethoven and Rachmaninov. Museum of the Contemporary History of Russia. March 29, 5 p.m.
Takenobu: American cellist, vocalist and composer of mellow neoclassical music in concert. FINOMI Hall. March 29, 8 p.m.
Bruno Bavota: Italian pianist, guitarist and composer of neoclassical and modern classical music in concert. FINOMI Hall. March 30, 8 p.m.
Pergolesi's Stabat Mater, Caccini's Ave Maria and Bach-Gounod's Ave Maria performed by the Moscow Boy's Capella, the Sounds Music Orchestra and Viktoria Smirnova (soprano). St. Mary's Cathedral. March 30, 7:30 p.m.